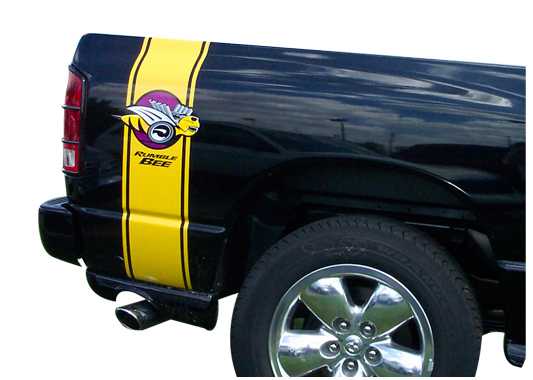 Rumble Bee Body Stripe Decals with OPTIONAL Build Number Rumble Bee Decal, rumble bee decals, Rumble Bee Custom Body Stripe Decals, 3SP Rumble Bee Body Stripe Decals, Rumble Bee Body Stripe Decals, Solar Yellow Rumble Bee Body Stripe Decals, Gloss Black Rumble Bee Body Stripe Decals, Silver Rumble Bee Stripe [3SP Rumble Bee Bed Stripe Decals] - $169.95 : 3rd Strike Performance, Your Source for Late Model MOPAR Performance Parts and Accessories! Are your decals for your Limited Edition Rumble Bee missing? Cracked? Want to change colors? We have them! We have these decals in all 3 stock colors - Solar Yellow, Silver, or Gloss Black. We also have these available in Reflective Yellow, Yellow Carbon Fiber, Matte Black, Black Honeycomb, Black Carbon Fiber, Reflective Black, Silver Reflective, or Silver Carbon Fiber. You can also "black out" your decals with the following option: Background color: None, Add: Rumble Bees Outline. Or you can choose the standard color bees, or even Reflective Bees! We have them available with both the Purple background and the Red background (very few had the red background). 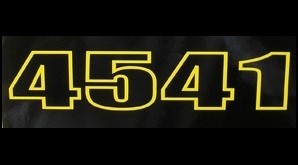 They are available with or without the truck number cut into the rear decal, choice is yours. Please note, you must choose what Rumble Bees you want or none will be sent. The Rumble Bees are optional.